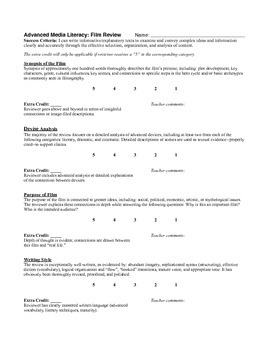 This film analysis rubric helps guide students in writing their own movie reviews. It gives students the opportunity to look beyond the entertainment factor in popular films and critically analyze the cinematic, dramatic, and literary devices as they contribute to the film as a whole. Students learn to perfect their writing skills while fine-tuning their ability to critically analyze multiple forms of literature.